Recipes are a very powerful feature of StayCut.com. Obviously they can be used to keep track of all your favorite recipes. In addition however, they behave like a saved meal that can be scaled to any serving size. They can also be converted to a food. Any time you want to combine multiple foods together, and then eat only a portion of that combination, the recipe feature is extremely valuable. Before StayCut.com, you would have to do a ton of calculations on your own to calculate the amount of each nutrient, but no longer. In this tutorial, I will create a very simple recipe with only two foods, a simple meat sauce with only a package of ground beef and a jar of sauce. This is enough to illustrate the power of the feature and teach you how to use it. 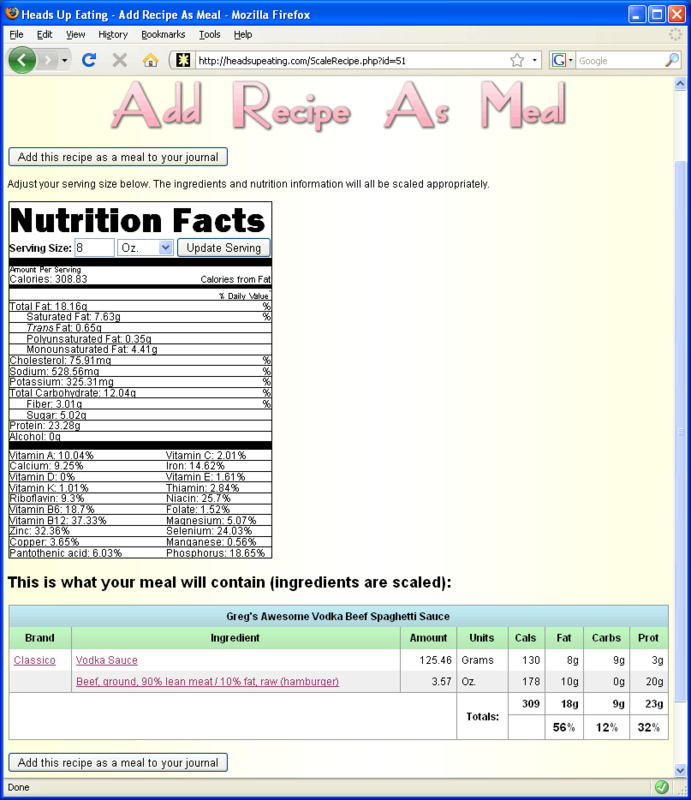 To create a recipe, you can either take an existing meal from your daily journal and click on create a recipe from this meal, or click on Edit at the top of bottom of any page and scroll to the bottom of the page to create a blank recipe. In this case, I will do the latter. 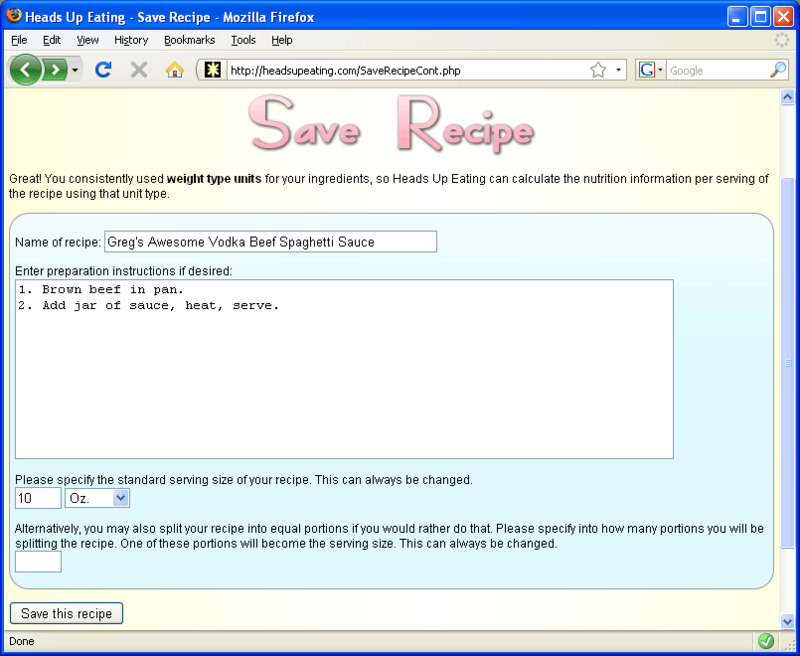 I will click on Create a new recipe at the bottom of the page. This brings up the Create a Recipe page, with a blank recipe. 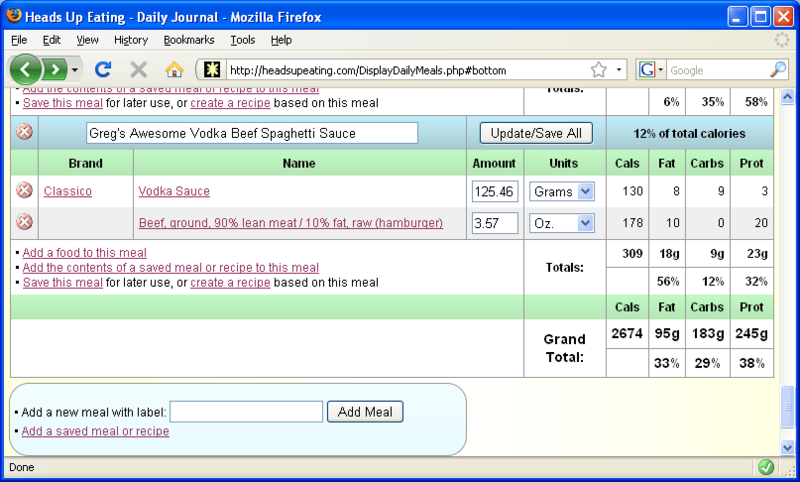 You must now add foods to your recipe, just like you would to a meal in your food journal. Clicking on Add an ingredient to this meal will bring up the Food Search page, just like adding a food to a meal. If you don't know how to add foods, see this tutorial. Something very important to note: you should try to match the unit types of all your ingredients if you can. That is, all ingredients should be in either all weight, or all volume type units. If you do this, you will have more flexibility in setting the serving size of your recipe. If you mix and match unit types, StayCut.com has no way of knowing how to proportion ingredients by either weight or volume--this would require knowing the density of each ingredient. However, if you do mix and match unit type, StayCut.com allows you to divide the recipe into equal portions, so it's still useful. Here I've already added the two ingredients, the jar of sauce and the package of beef. Once you have all your ingredients with their proper amounts set, click on I'm done adding ingredients. This brings me to the Save Recipe page. Here is where you enter the name, optional preparation instructions, and set the default serving size. Once you're done entering everything in, hit Enter or click Save this recipe. 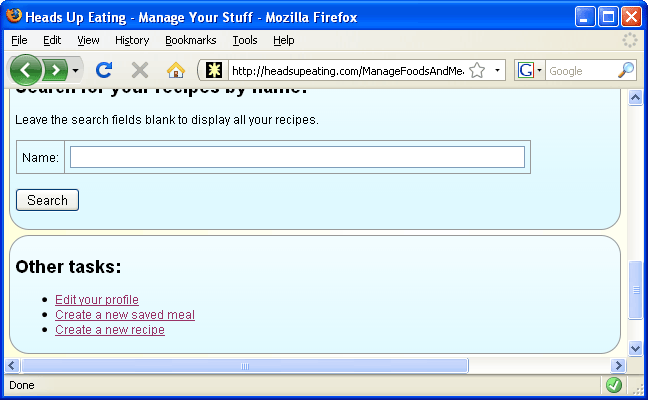 This brings up the Saved Recipe Details page. 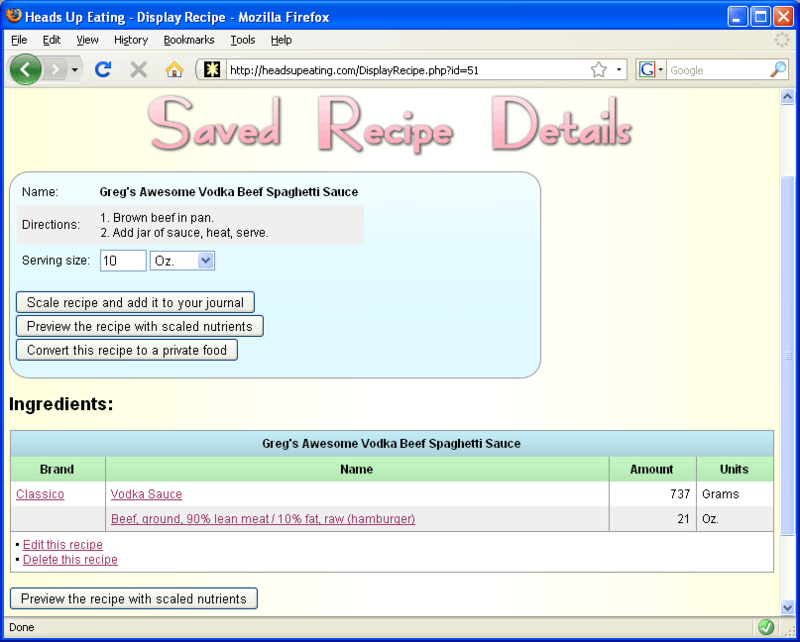 This displays the recipe with your preparation instructions and ingredients. If you want to add the recipe as a meal to your food journal immediately, you may adjust the serving size and click Scale recipe and add it to your journal, or get a preview of what your meal will consist of with the scaled ingredients, click Preview this recipe with scaled ingredients. You may also convert the recipe to a private food by clicking Convert this recipe to a private food. In this case, I would like to preview the scaled recipe before I add it to my journal as a meal, so I will click Preview this recipe with scaled ingredients. This shows you your recipe scaled to your desired serving size, and the nutrients it contains. You may experiment with different serving sizes. 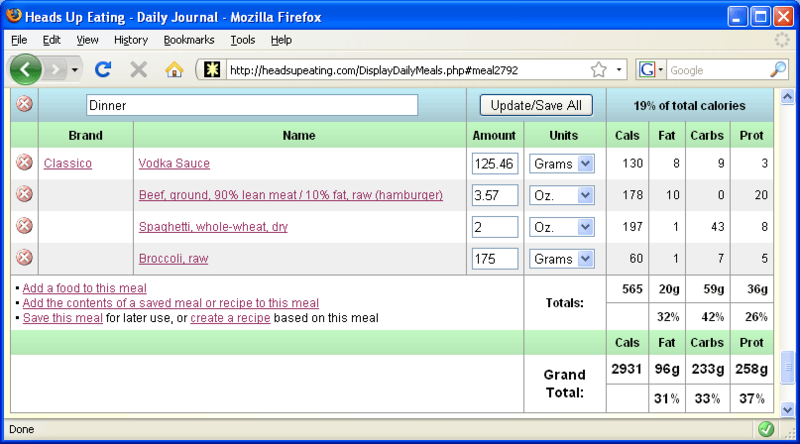 When you have the correct serving size set, hit Enter or click Add this recipe as a meal to your journal. This will add the recipe as a meal to your daily journal, with all the ingredients scaled so that the total serving size will be what you set on the previous page. I want to add a couple more foods to this meal, so I'll go ahead and do that now. I'm gone ahead and changed the name as well. Here is my complete meal.